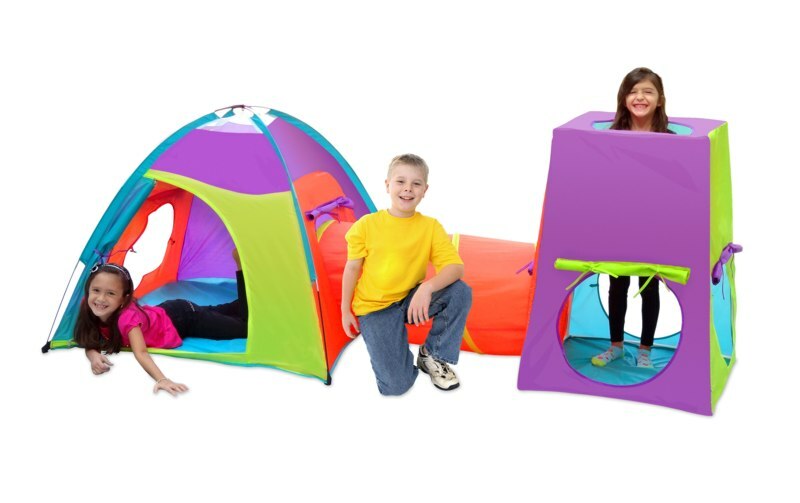 • Bright Colors and several different rooms make this play tent-tunnel combination a must have for your child. Guaranteed to provide hours of fun and enjoyment as well as stimulate the imagination. • All of the pieces can be used alone or attached together. • The tent has 2 shock corded fiberglass poles and pole pockets for quick and easy set up, the tunnel has a wrapped steel spring frame sewn into a sleeve for safety and the cube has an internal 1 piece shock corded plastic pipe frame. • Made from 170T 450mm coated polyester for the tent walls, tunnel and the cube these are made to last for years of play. • The tent floor is made from durable and waterproof coated polyester for no hassle set up and cleaning. • Both the tent and tunnel have ample ventilation through windows and vents. • The tent and cube both have zippered doors which open wide to allow easy entry. • The tent has 2 large vents in the roof while the cube has a large circular port in the top. • The tunnel attaches to the cube and tent using simple loops and toggles. • The tent comes complete with storage bags for the tent, and poles.